Are You Making The Most Of Your Pool? Servicing Pools in Maryland, DC, and Northern Virginia for over 30 Years. Fill out our form to the right for more information, or to be contacted for a service visit. If you are ready to schedule work, scroll to the bottom. Pooltek can provide you with all of your swimming pool service needs, from Openings, Closings, and Summer Maintenance, to Equipment Installation and Repairs. We also offer reconstruction services, from small patch repairs, to Complete Coping, Tile, and Plaster Renovations. Pooltek was founded in 1986 as a family-owned and operated pool service provider. Our goal is to provide a higher quality of pool maintenance by utilizing only the best-trained technicians, recommending only the most proven reliable equipment, and maintaining the small company attentiveness that clients hope for. What this has meant for you, the client, is reliable, personalized attention for your multi-thousand dollar investment, and enjoyable Summers of problem-free swimming. 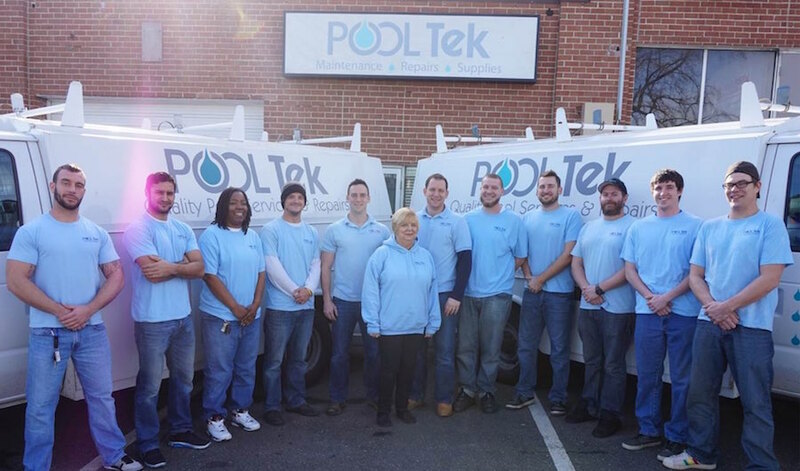 All Pooltek crews are headed by full-time, year-round employees, who attend technical classes and receive training on chemistry, hydraulics, and all types of equipment, so you know your pool is being taken care of. With a knowledgeable office staff and all crews equipped with cellular communication, we can handle all of your equipment needs and emergencies rapidly, so you can get back to enjoying your pool. If you have cracks in the wall, badly stained or etched plaster, poorly caulked seams, or missing and torn deck then now may be the time to consider minor construction work or a complete renovation of your swimming pool. “Pooltek exceeded my expectations. We opted for a somewhat minimal service, but my pool was left sparkling and ready for winter. Even in October, they were booked out a bit (good sign), but we had them come as soon as possible. They showed up and got right to work cleaning out the mess of old leaves we weren’t able to get ourselves. The techs were professional and friendly and offered some advice on my options.